"For those who want to talk a lot about World War II, if it's about occupation, then we could also talk about it (Muslim prayers in the streets), because that is occupation of territory." "It is an occupation of sections of the territory, of districts in which religious laws apply. It's an occupation." "There are of course no tanks, there are no soldiers, but it is nevertheless an occupation and it weighs heavily on local residents." For speaking her mind about a disturbing reality that grips the streets of Western nations, the EU revoked her parliamentary impunity on July 3, 2013 so that she could be prosecuted for hate-crime charges in French Court. Sajjad Karim, a British Tory MEP on the parliament's legal affairs committee, was among those who voted for the revoking of Ms Le Pen’s parliamentary immunity. "And He made you heirs to their land and their dwellings and their property, and (to) a land which you have not yet trodden, and Allah has power over all things." The sentence “They do not forbid what Allah and His Messenger have forbidden” in the above verse means that they do not accept what Islam ordains, i.e. Islam’s divine law or Sharia. So, as per this divine command of Allah, Christians and Jews, who do not follow the law of Islam and reject the religion of truth (i.e. Islam), must be fought relentlessly until they submit to Islamic rule and law and pay special taxes (jizya) Allah has levied upon them. What better way to re-conquer the streets for Allah than to fill them with tens of thousands of Muslim men. The entire area is paralyzed. Kafirs cannot come into these areas during prayer. Muslims praying on the streets of Paris. Muslims praying on streets of London. Muslims praying on Streets of Moscow. Therefore, as soon as the time of prayer arrives, Muslims must prayer wherever they are – whether in a mosque, in a hallway or park, on a sidewalk or parking lot, or even on the street. The entire surface of the earth is a prayer mat for them, which entirely belongs to them. 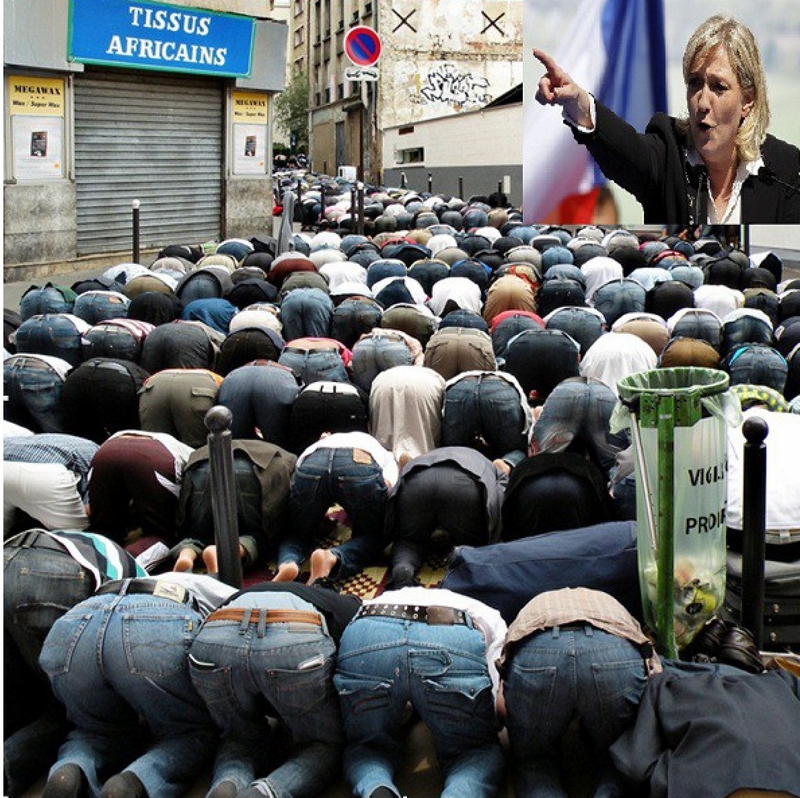 So, Ms Marine Le Pen has a made a grave mistake by boastfully speaking against what Allah, the Lord of the Universe, has made lawful. And opposing Allah has its due punishment, a painful doom, which will start with her facing the French Court.